*NEW* Check out the full video here: Ayurveda for Kids, School Lunch Ideas. Raise your hands, who has kids? 1, 2, 3...good! At least 3 of you do so this is good to share and even if you don't have le kiddos, you can use this for yourself! 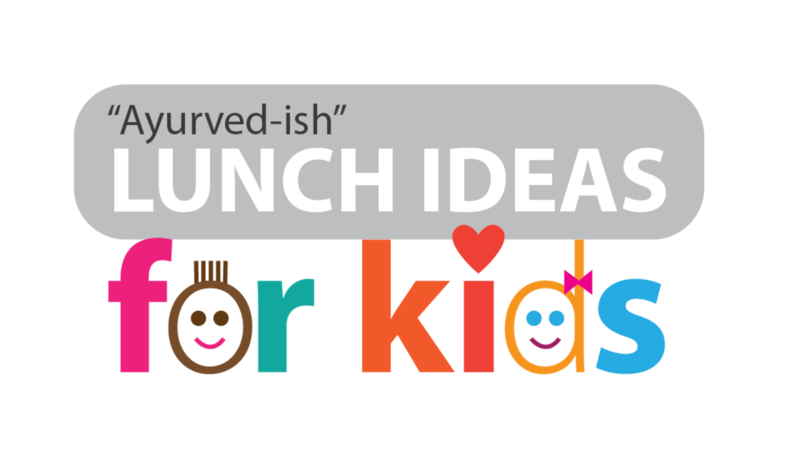 Anyone struggle coming up with new and healthy ideas for the kids lunches? *me raising my own hand! * OH! ME! When my daughter started kindergarten, it was a new game making her lunches every day. Without a plan, I knew I'd be harried and absent-minded when trying to cobble together a good lunch. "Girl! Get it together and just write it all down." So I did! I wrote down a bunch of lunch and snack ideas on a piece of paper and stuck it to the inside of my cupboard. Then I thought, "Hey I could make this pretty and my Ayurvedic peeps might love this too!" 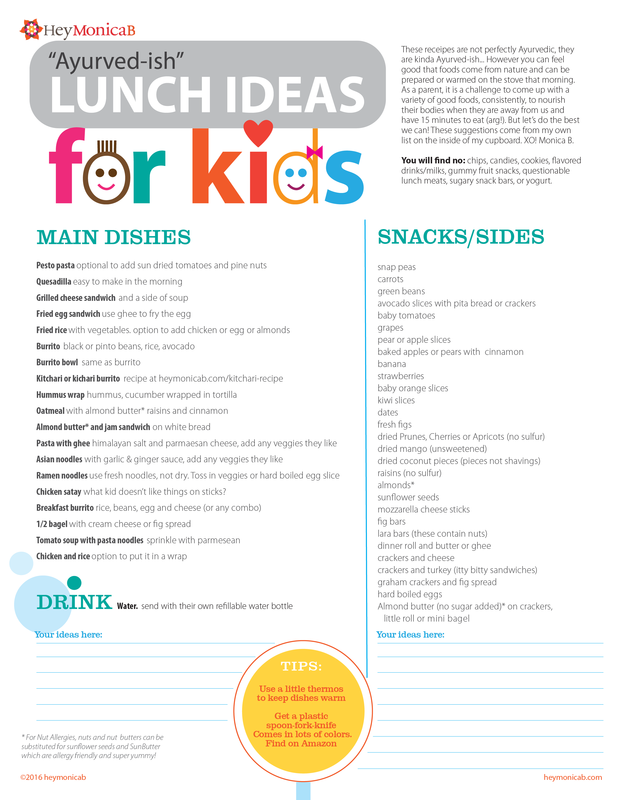 A gift from me to you, please enjoy this list of lunch ideas for kids. HINT: Most of these are taken from dinner the night before so these can do double duty as dinner ideas also — then just stick them in the lunch! NOTE: They are not pure Ayurvedic...they are kind of "Ayurved-ish." (see reasons why below). Why are these kids lunches not *exactly* Ayurvedic? #1 Lunch is the biggest meal of the day. I mean, if the kid eats, you can pack a big enough meal. Or like most, they will be totally distracted by their friends that they will skip most of it and smoosh the rest back into the lunch pack. And they will come home starving (*shakes fist* anyone see how our eating habits can become backwards at a very early age?). #2 Eat happy and calmly. She's happy for sure. But some only get 15 minutes for lunch (*shakes fist again*). No way can a child fit in a "big lunch" in 15 minutes. #4 Fruit should be eaten alone. Yes, yes it should. My daughter knows the rule, but will chow fruit however she pleases when I'm not around. We can't control how they combine their food. #5 Eating for their doshas will vary. Depending on their dosha, some foods will benefit them more than others. Don't over think that at this point, just do the best you can. Here's what goes through my head for my pitta-vata kid, "She needs grounding/carb foods, a little protein, fruit, veggies, healthy fats and water." You can reference the dosha menus to see what foods in general work best for your kiddo, depending on their dosha. Whattaya say is this helpful for you? If I confused the dickens out of you please let me know. AND! OR! If you have ideas to add, we'd all love a sharing of more great lunch ideas and recipes so feel free to share in the comments.